Tin Size .5 oz. [Sold out] 1 oz. Crafted with the intent to use it before bed and for use around Samhain. Absinthe inspired herbal salve. Made with olive oil, beeswax, organic artemisia absinthium (wormwood), organic artemisia vulgaris (mugwort) and organic rosemary oil. The way the artemisias in this recipe are used turn the flying ointment a beautiful green color. Wormwood is also known as absinthe. Mugwort is traditionally associated with dreaming and sleep. Rosemary is traditionally associated with sleep and memory. Wormwood, mugwort, and rosemary are traditionally used for aches and pains. 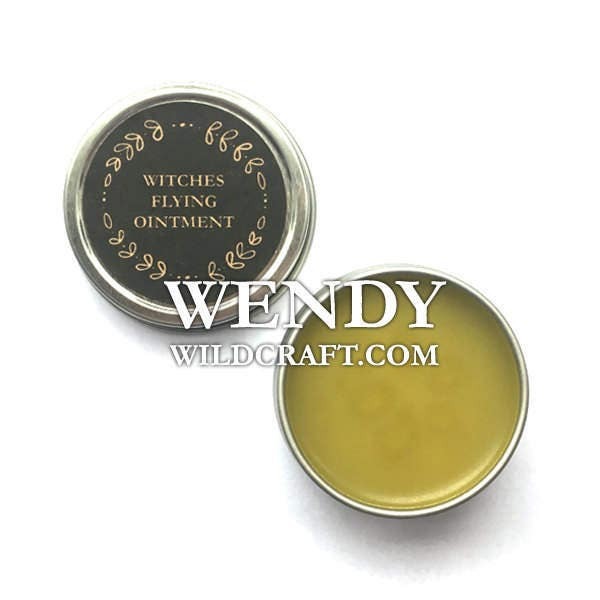 If you enjoy working with wormwood or mugwort you may enjoy the use of this flying ointment. I use this salve before meditation and before sleeping. To use, apply a pea size amount to the pulse points avoiding contact with mucus membranes. Ointments differ for everyone. 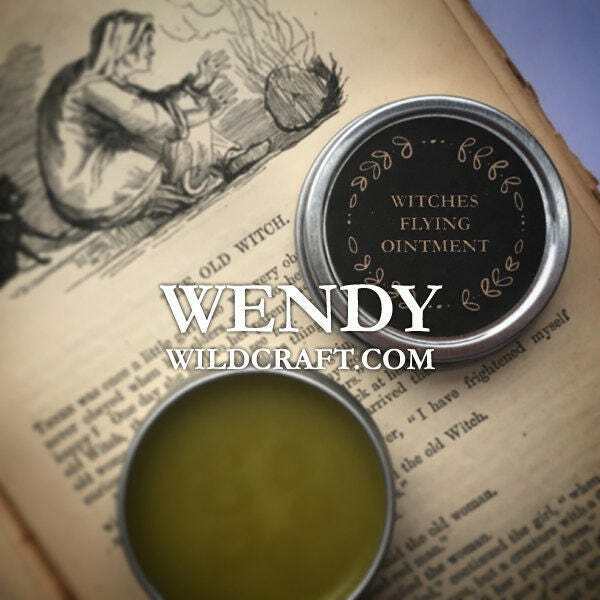 If you have a great connection with artemisias you may also enjoy this salve. Artemisias, wormwood and mugwort, are associated with the Goddess Artemis and Diana. Made in small batches. Herbal salve is for external use only. Don't use artemisias while pregnant/breastfeeding. Research is recommend before using thujone containing wormwood and mugwort. Keep ointments away from kids and pets. Store ointment away from heat and sunlight. 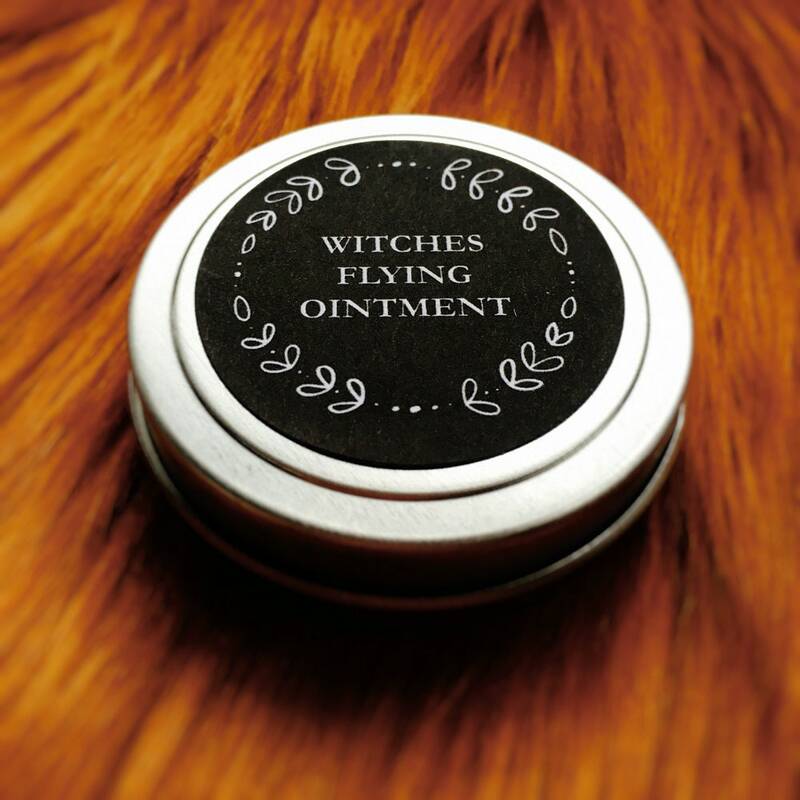 Witches Flying Ointment is also known as Flying Ointment, Green Salve and Dream Salve. These are natural, salve color may differ slightly. It's recommend to consult with your doctor before using herbal products. .5 oz. or 1 oz. tin. Lovely! Will definitely purchase from again! Quick delivery, great packaging, and even better product! Love the smell and not too greasy. A little bit goes a long way. Packaged beautifully and arrived safely. Gorgeously potent. Thank you. Thank you, thank you.